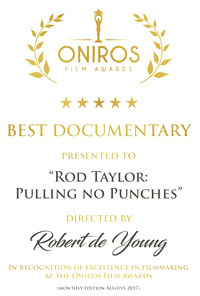 Here's a roundup of prizes and film festival selections for the documentary, "Rod Taylor: Pulling No Punches." 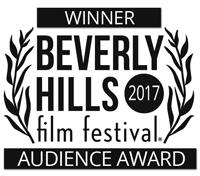 Pulling No Punches premiered in the U.S. at the Beverly Hills Film Festival and promptly won the Audience Award for Best Documentary. The movie screened on Thursday evening, April 27, 2017, at the TCL Chinese Theaters on Hollywood Boulevard. 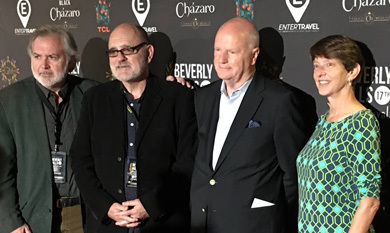 Robert de Young, Stephan Wellink, Nick Eddy and Diane Tomasik at the Red Carpet event before the screening. Stephan Wellink, producer, whose steadfast appreciation for Rod Taylor had its roots in childhood and culminated in this splendid film. Robert de Young, producer/director. Robert had previously done films on Australian actors Errol Flynn and Peter Finch, making his partnership with Stephan Wellink a perfect fit. Simon Wellink, camera operator, sound engineer and son of Stephan Wellink. Stephen Vagg, the author of "Rod Taylor: An Aussie in Hollywood." He was a consultant on the film and appears on screen, bringing perspective to aspects of Rod's career. Nicholas Eddy, Rod's friend and attorney in Australia, who also appears in the documentary. Liz Ploger, a former MGM worker who was Rod's fan club president in the 1960s as well as a longtime Taylor family friend. Diane Tomasik, yours truly, the creator and keeper of this website. I received a "special thanks" credit in the film and was thrilled to have been included in the festivities surrounding the screening. You can see photos of filmmakers and friends via an album at my Facebook page. "Pulling No Punches" continued its winning ways at its second U.S. screening, receiving the award for Best Feature Documentary at the Burbank International Film Festival. The screening, on Sept. 10, 2017, was followed by a Q&A with Tippi Hedren and Veronica Cartwright, Rod's co-stars from "The Birds." The Q&A was moderated by Cari Beauchamp, a renowned film historian, documentary filmmaker and author. The panel discussion is part of the DVD release of the film by Umbrella Entertainment in Australia. 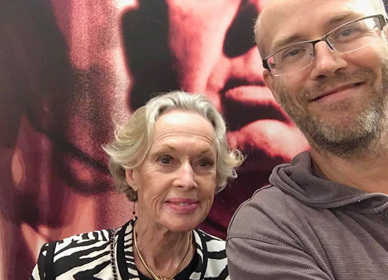 Tippi Hedren and Stephen Vagg, author of Rod's biography, at the Burbank film festival. The Rod Taylor documentary had two well-received screenings and all-around positive reviews in Glasgow. 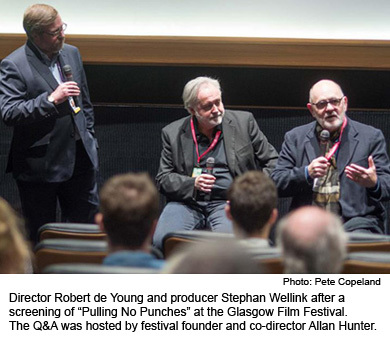 Pulling No Punches was shown Feb. 25 and Feb. 26, 2018, during Glasgow's 14th annual celebration of cinema – now one of the largest film festivals in the UK. The festival showcased more than 180 films from 51 countries. The Australian-made Rod documentary was part of the "Stranger than Fiction" strand of films featuring true stories. The screenings were followed by Q&A sessions with director Robert de Young and producer Stephan Wellink. Wellink applauded the "great feedback from a well-informed audience during the Q&A." Eye for Film called the documentary "one of the most enjoyable works of its kind.... Even if you have no idea who he is when you start watching, you’re guaranteed a good time – and that was Rod Taylor, all the way." The Peoples Movies said that Rod Taylor, "even in the later stages of life and battling illness, proves to be a charismatic and exuberant storyteller. Taylor is clearly enjoying reminiscing and it's undeniably infectious to behold." 60 Minutes With reviewed the DVD stating: "Featuring '60s style animated graphics and music, "Rod Taylor: Pulling No Punches" has all the pizzazz of a TV show/movie that Rod would have starred in back then, while also shining a light on all of the fantastic work that he has done over a long and varied career." "Pulling No Punches" received an Award of Excellence in the Impact Docs Awards 2018. Impact Docs is an international awards competition -- not a traditional film festival -- designed to help industry professionals who create fresh, standout documentaries achieve the publicity and credibility they deserve. Entries do not compete against each other but are judged against a high standard of merit and are scored accordingly. The film earned two laurels in the Oniros Film Awards (OFA), a monthly and annual award competition based in Italy. For August 2017, the award for Best Documentary was presented to director Robert de Young and Best Producer was presented to Stephan Wellink. The OFA's mission is discovering quality and ambitious films by promoting filmmakers’ works and by helping them realize their dreams. The name of the award comes from the Greek word oneiros, which means "dream." The Rod documentary earned one of the top prizes -- Award of Excellence: Special Mention -- in the season's IndieFEST judging, announced in August 2017. The IndieFEST Film Awards is not a traditional film festival. Rather, it is an international awards competition that strives to give talented directors, producers, actors, creative teams and new media creators the positive exposure they deserve. 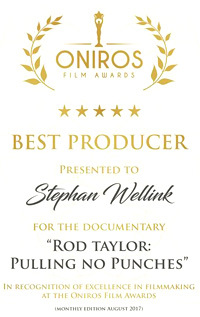 Stephan Wellink, Robert de Young and the team behind the Rod documentary certainly deserve the opportunity and accolades! Participating in a Directors Panel at the Gig Harbor Film Festival: James Cho, "Pulling No Punches" director Robert De Young, Sky Bergman, Jon Weinbert and Meg Valliant. "Pulling No Punches" was well-received when it screened at the Galaxy Theatre during the Gig Harbor Film Festival on Saturday, Oct. 28, 2017. After the screening, director Robert de Young fielded questions from the enthusiastic audience. Hollywood International Moving Pictures Film Festival: Award of Recognition for Best Documentary Feature, August 2017. Hollywood International Independent Documentary Awards: Award of Excellence, August 2017. Atlanta Docufest: Semifinalist in the Atlanta International Documentary Film Festival 2017. The Monthly Film Festival: Finalist for Best Feature Film among the nominees considered in September/October 2017. Spotlight Documentary Film Awards 2017: "Pulling No Punches" earned a Gold Award, which celebrates incredible films with the second highest scores from the panel of judges. 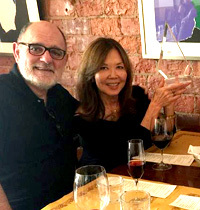 "Pulling No Punches" producer Stephan Wellink with Carol Kikumura Taylor, Rod's wife, who is holding the award from the Burbank International Film Festival.